Anthony Miler is as much a painter of the human subject as he is of its unruly tendencies, which he denotes with jarring swathes of color, jagged lines, and tangles that teeter into abstraction. 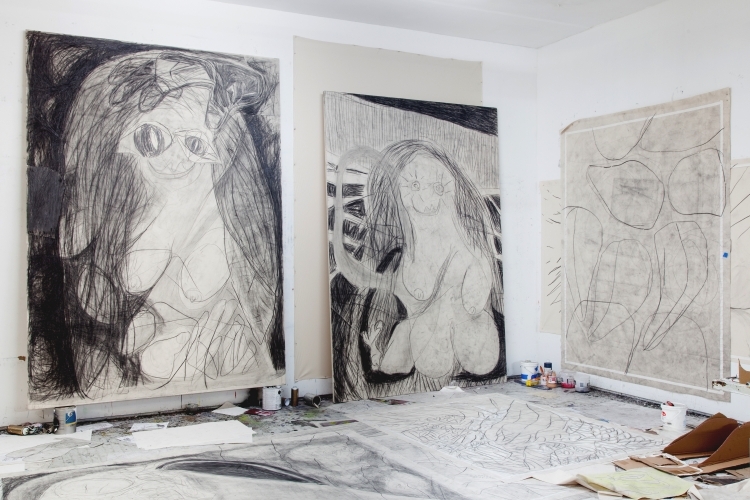 One can see in Miler’s canvases and works on paper an affinity for the brutally reduced forms of the CoBrA Group, the insistent informality of Art Brut, or echoes of the forceful brushwork of Abstract Expressionists like Franz Kline, Philip Guston, and Willem de Kooning. Yet it is impossible to summarize Miler’s work through art historical references alone. Miler is firmly entrenched in contemporary life, in a society where digital and industrial methods of production are multiplying dehumanized forms and sleek interfaces. In his insistent defamiliarization of human forms and his mixing of traditional and unconventional art materials, Miler’s work embodies a raw critique of our cultural moment. This response to a world in ongoing motion is itself a perpetual exploration, reflected in the artist’s working methods. Miler is thoughtful but deliberately uncalculated. By embracing spontaneity and experimentation, Miler constantly pushes both his hand as well as his materials to unpredictably surprising and viscerally evocative capacities.